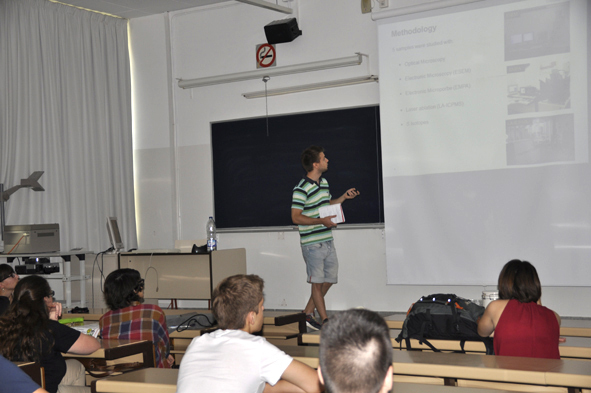 Due to the success of the first workshop devoted to pegmatites organized by the Barcelona Student Chapter a year ago, a second workshop was planned for the days 19th to 21st of September of this year. In this occasion the topic was the ore deposits related to acid magmatism. 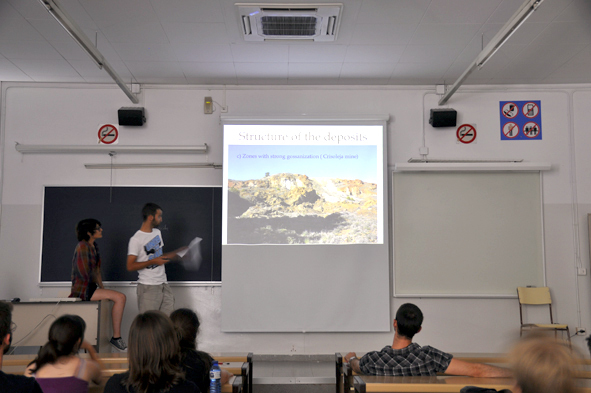 The workshop, held at the Faculty of Geology of the University of Barcelona, was addressed to students and young researchers interested in this type of ore deposits, as well as to professors, researchers and professional geologists who wanted to increase their knowledge and be up to date of the latest research on this topic. Therefore, the aim of this workshop was to provide an advanced overview of mineral deposits related to acid magmatism, including mineralogy, textures, petrology, geochemistry and economic interest of these deposits. The workshop included an enlightening two-hour introductory lesson entitled “Felsic magmatism and hydrothermal systems” kindly given by Prof. Bernd Lehmann (Technical University of Clausthal – Germany). The main day of the workshop consisted of a one-day session of lectures given by international experienced specialists on this topic. Thus, the talk by Prof. José Mangas (Universidad de las Palmas de Gran Canarias – Spain), entitled “Spanish Sn deposits associated to Hercynian granitic intrusives” explained the three stages of formation registered in the Spanish deposits deduced from the fluid inclusion study; Prof. Mangas also emphasized the economic potential of tin mines, most of them closed, in countries such as Spain, Portugal, Germany or the Czech Republic. Prof. Fenando M.P. Noronha (Universidade do Porto) moved from tin to tungsten deposits with the talk entitled “Tungsten ore deposits in Central Iberian Zone”; all the audience could enjoy his talk in which the Panasqueira mine was clearly the main focus. Prof. Bernd Lehmann (Technical University of Clausthal – Germany), with his talk “Granite-related rare-metal mineralization”, explained the geochemistry of the tin and the tantalum in the magmatic-hydrothermal system and the concentration mechanisms. Finally, Dr. Hildebrando Leal-Mejía (University of British Columbia - Canada) explained the evolution of the Phanerozoic acid magmatism in the Colombian Andes and its relationship with Gold Deposit genesis. At the end of the conference session, homage to Prof. Antonio Arribas Moreno was held. The act, leaded by Prof. José Mangas, served for introducing this important personality in the world of the mineral deposits to those who did not know his very active and complete scientific live. 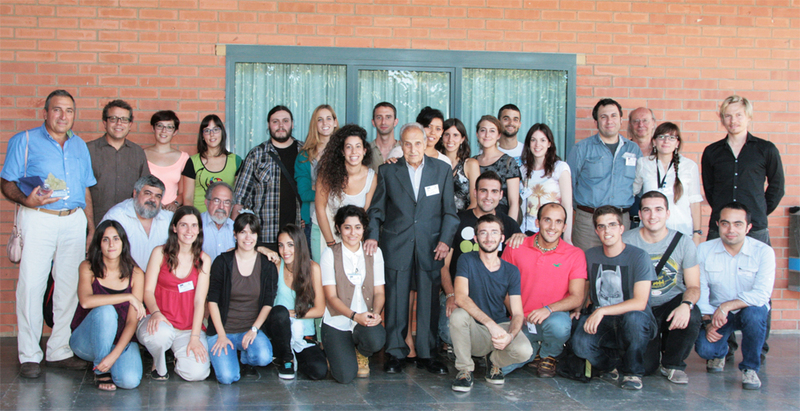 Prof. Antonio, who is now 90 years old, kindly attended our workshop. Some personalities such as Prof. Fernando Noronha and Dr. Joan Carles Melgarejo took advantage of the homage to publicly thank Prof. Antonio for their support during the development of their scientific careers. Some videos of people who could not attend the workshop were reproduced, such as those recorded by Saleh Lehbib (PhD student from the Sahara Occidental) and Prof. Antonio Arribas Jr. (president of the SEG and son of Prof. Antonio Arribas Moreno). Finally, Prof. Antonio Arribas Moreno was proposed as Honorary Advisor of our Student Chapter. After he accepted (with pleasure, according to his words) this position, we are so pleasured and honored of announcing that Prof. Antonio Arribas Moreno is now our Honorary Advisor. Additionally, a fieldtrip leaded by Dr. Joan Carles Melgarejo, advisor of the Barcelona Student Chapter, to the Barberà Basin (Conca de Barberà) took place. During this one-day fieldtrip the attendance could observe the quartz-wolfram veins in hercinian granitoids, polymetallic sulphide mineralisations (Pb-Zn-Cu-Au-PGE-Bi-Te-As-Ni-Co-V-Cr), barite veins and XVIth century alum mines. Mineralogical and petrographical aspects of the ores and host rocks were combined with geochemistry, fluid inclusion data and large-scale tectonics, in order to have a broad view of the visited ore deposits and their environment. We hope that you all enjoyed the workshop. Past wednesday 18th of september elections were held to elect a new council of our Student Chapter. Following the submissions of contenders, members who atteneded the meeting voted for the only list presented. Finally after all hands up for, the list of representatives was elected unanimously. We need to thank our past council who worked hard to implement this Student Chapter and get were we are. Thanks to Thomas Ailgsperger for being an exelent president and to the rest of the team: Lisard as vice-president, Cristina Vilanova as secretary, Sandra Amores as treasurer and David Artiaga as web master. Now is time to pass the baton to new team and still have achievements that we have had to date. Congratulations to Lisard Torró, our new president, and rest of council, Stefania Schamuells as vice-president, Núria Pujol as secretary, Lena Portell as treasurer and Omar Corrales as webmaster. Further positions newly created include Marina Galindos as Signage Committee, Sònia Jou as Ludic Events Committee, Maria Clara Roman as 3rd year Student Committee, Júlia Farré as 4th year Student Committee and Sandra Amores as PhD Student Committee. During this September, 8 members of our Student Chapter had the opportunity to attend the “Gold deposits: from theory to exploration practice” course, held at the “Faculty of Science, Charles University Prague, Czech Republic” and given by professor David Groves. 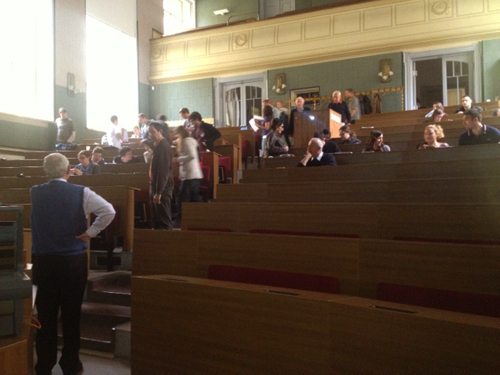 The first lecture consisted on an introduction to exploration philosophy and techniques. During the next two days, two models of gold deposits formation were presented: the gold deposits related to intrusive activity in lithospheric boundaries and the orogenic gold deposits. Finally, the course ended with a lecture about the Mokrsko gold deposit located in the central part of the Bohemian Massif, by Professor Jiri Zacharias. In order to discuss this subject we divided in small groups so it would be easier for all of us to take part in the debate. Apart from all we had the pleasure to learn, we also had time to enjoy the nightlife of this monumental city. To conclude, we would like to highlight the many friends from other Student Chapters we made, especially with the Siberia group. The fieldtrip, developed in this region of great geological and metallogenetic interest, included a first day in which different outcrops and mines near the Bellmunt del Priorat town where visited. Thus, we walked next to the Siurana river to visit the pre-Cambrian rocks outcroping there and containing small concentration of sulfides. Different abandoned mines, some of them now converted into wine cellars or touristic mines, where also visited. Mines such as "La Serrana", an stratabound Mn mine, "Mina Règia" and "Mina Eugènia" (mines exploted mainly for Pb and closed in the 70s) and "Mina Linda Mariquita" are included. We would like to highlight the visit to the underground work visit to mina Eugència. The second day other mineralized areas such as the occurrences in the "Mas del Mestre" area, close to Flaset, and some outcrops close Valls town where visited, so that at the end of the day we could reach our goal, which was understanding the geology and the metallogeny of the region. The graphic material presented by Dr. Joan Carles Melgarejo at the end of the day greatly helped in this sense. In addition to the geological aspect of the fieldtrip, the attendants could delight some of the most delicious wines of all the country (and world). The nights sleeping in the floor of the classroom of the Bellmunt del Priorat’s school are also well remebered. Although we were not very lucky with the weather we had a great time and it was a wonderful experience! The Barcelona Student Chapter is glad to inform you that the registration to our second workshop is now open! As a result of the resounding success of the Pegmatite Workshop (October 2012), we decided to organise a new one, which we hope will be very interesting for students, young scientists and professional geologists. Therefore, this year we welcome you to join us on the SGA Workshop on mineral deposits related to acid magmatism that will be held in our faculty on September 19th-21st . A one-day field trip to visit polymetallic sulphide mineralisations (Pb-Zn-Cu-Au-PGE-Bi-Te-As-Ni-Co-V-Cr) in the Barberà Basin. You can read further information here and you can download the registration form here. Last week (August 12-15th) twenty-three members of the Barcelona SGA Student Chapter attended the 12th SGA Biennial Meeting at the University of Uppsala, Sweden. Most of the students presented their last research results as posters and Cristina Villanova and Thomas Aiglsperger gave a talk (and they did so well!). We gratefully acknowledge the SGA for the inscription and travel grants that allowed the participation of the Barcelona SGA SC in such a meeting point on Mineral Deposits. During these four days we have attended different talks on different kinds of mineral deposits from all over the world. It was also an opportunity for various mining companies to promote themselves and to look for students which may be interested in joining them for future jobs or internships. The BCN SGA SC found this evening activity very positive for the students. Also, we were warmly welcomed by the local students in Uppsala. They provided us a student card to join the different "nations", the students' bars and restaurants, and we spent a great time with the student staff of the 12th SGA Biennial Meeting. This meeting has been a great experience for us and a great success for the organization team! Congratulations to the organizing committee, to the companies and to the students that made it possible!!! We hope we will participate in the next SGA Biennal Meeting in Nancy (France)! 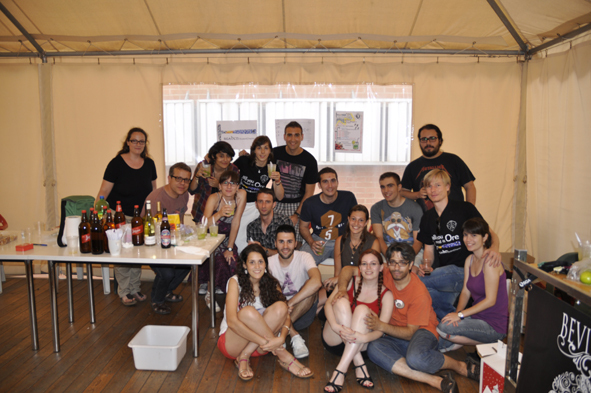 The first END OF TERM PARTY of the SGA Barcelona Student Chapter took place on Friday July 19th at the Faculty of Geology (Universitat de Barcelona). This event consisted of four sessions of 10-minute talks in which some of the Student Chapter members explained their current research topics in English. The speakers performing the talks were 3rd and 4th year pre-graduate students of Geology and PhD students. The first session started at 10 am and the last finished at about 5 pm, including a coffee break and the lunch break. The academic activity ended in an evening party in the terrace of the Faculty, with nice music, fresh drinks, such as the impressively delicious variety of craft beers sponsored by Raul Benages (BEVIRRA) or the best caipirinhas ever prepared in Barcelona by the advisor Joaquín Proenza, soft drinks and snacks. Well received by professors and proved to be very positive for the students, the activity was an absolute success. You can see some pictures of the party here. 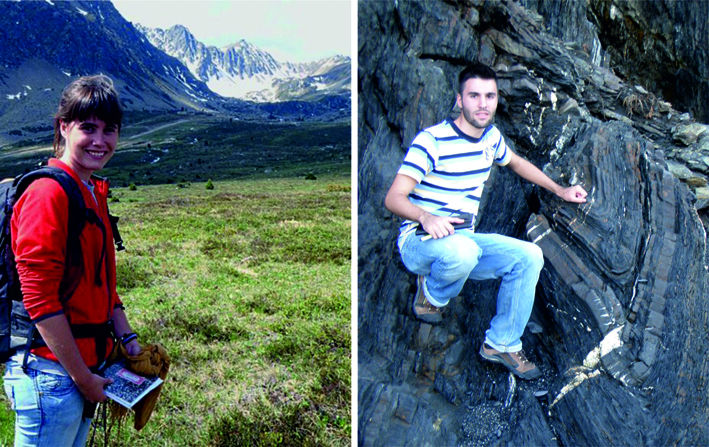 Four members of the Barcelona SGA student chapter, Sandra Amores, Marc Campeny, Montgarri Castillo and Lisard Torró, all PhD students, have been awarded a Student Research Grant from the Society of Economic Geologist in order to develop the fieldwork related with their PhD during 2013. Particularly, these four grants are provided for the Hugh E. McKinstry Fund which granted students whose projects involve studies of mines or ore districts, topical studies toward improved understanding of ore genesis, and experimental research in field applications. Sandra Amores has been selected to receive a grant for an amount of $US 3,750 to sample and study Monte Verde and Coola carbonatites from Huambo province in Angola. Marc Campeny has been awarded $US 2,500 to carry on with his research in Catanda extrusive carbonatite located in Kwanza Sul, Angola. Montgarri Castillo received $US 3000 in order to advance in her research in diamantiferous kimberlites from Angola. Finally, Lisard Torró has been awarded $US 3000 to finance the fieldwork related with a detailed mapping of the Hatillo Sheet (central Dominican Republic) where Cerro Maimón and the world-class Pueblo Viejo deposits are located. Title: The Sonora stratiform barite deposits: relation and analogy with the methane cold seeps (Els jaciments estratiformes de barita de Sonora: relació i analogia amb els cold seeps de metà). Lecturer: Dr Carles Canet Miquel. Dept. Recursos Naturales, Instituto de Geofísica & Head of the Dept. Geoquímica, Instituto de Geología (Universidad Nacional Autónoma de México). Date: Wednesday 26th June 2013, 12.00h. The Mazatán barite deposits, Sonora, NW Mexico, represent an outstanding example of Paleozoic bedded barite, a poorly understood type of mineral deposit of major economic interest. The deposits of this type commonly occur hosted by shales and are characterized by the lack of base-metal sulfide mineralization, in contrast to classic sedimentary-exhalative (or SEDEX) deposits. 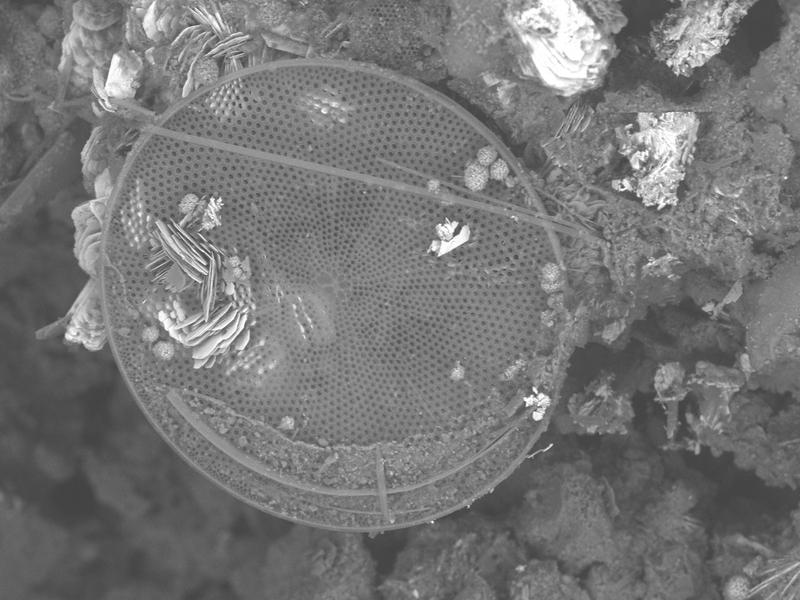 A throughout study of the Mazatán barite deposits, based on petrography, fluid inclusions analyses and isotope geochemistry, confirmed the link between bedded barite and fossil hydrocarbon seeps, thereby leaving hydrothermal vent-related processes ruled out. Hence, modern cold seeps in continental margins would account for the geological setting and genetic aspects of this type of deposit. The largest barite bodies of Mazatán are hosted within an Upper Carboniferous flysch succession, which formed part of an accretionary wedge related to the subduction of the Rheic Ocean beneath Gondwana. As well, a few barite occurrences are hosted in Upper Devonian, pre-orogenic turbidites. A variety of mineralized structures is displayed by barite, including: septaria nodules, enterolitic structures, rosettes and debris-flow conglomerates. Barite is accompanied by chalcedony, pyrite (framboids) and berthierine. Gas-rich fluid inclusions in barite were analyzed by micro-Raman spectroscopy and methane was identified, suggesting the occurrence of light hydrocarbons in the environment within which barite precipitated. 13C-depleted carbonates (δ13C: -24.3 to -18.7‰) were found in the barite deposits; they likely formed through anaerobic oxidation of methane coupled to sulfate reduction. Besides, these carbonates yield negative δ18O values (-11.9 to -5.2‰) reflecting the isotopic composition of Devonian−Carboniferous seawater; alternatively, this 18O-depletion could reflect late diagenetic processes. Methane-derived carbonates occur at modern hydrocarbon seeps and have been reported from Mesozoic, Cenozoic and even Paleozoic seep sediments, but they have never before been described in Paleozoic bedded barite deposits. δ34S values of barite vary from +17.6 to +64.1‰, with the lowest values overlapping the range for coeval seawater sulfate; this distribution indicates a process of sulfate reduction. Barite precipitation can be explained by mixing of methane- and barium-rich fluids with pore-water (seawater) containing sulfate residual from microbial reduction. Two analyses from barite gave an 87Sr/86Sr within and slightly above the range for seawater at the time of deposition, with 0.708130 and 0.708588, which would preclude the involvement of hydrothermal fluids in the mineralization process. Two members of the Barcelona SGA Student Chapter, Carlos Arbiol and Núria Bach, have been awarded a very prestigious and competitive scholarship to develop their Master studies at the University of Geneva (Switzerland). Here you can see the list of candidates from all over the world that were also awarded an Excellence Master Fellowship at the Faculty of Sciences of this University. They will study for a two-year degree in Master of Science in Geology, orientation Geochemistry, Petrology and Ore Deposits. Hiding our well-meaning envy, we all wish these two excellent students a very fruitful stay in this fabulous city. Last week Cristina Villanova, our secretary, attended the EMU School 2013 "Minerals at the nanoscale", about fundamentals and aplications of High Resolution Transmission Electron Microscopy in Mineralogy. The course was held in the Centro de Investigación Científica (CIC) of the University of Granada from June 3th to 6th, with the participation of experienced international lecturers, and including practical lessons in the high level transmission electron microscopy facilities of the centre and exercises to learn how to interpret the results obtained by this technique. 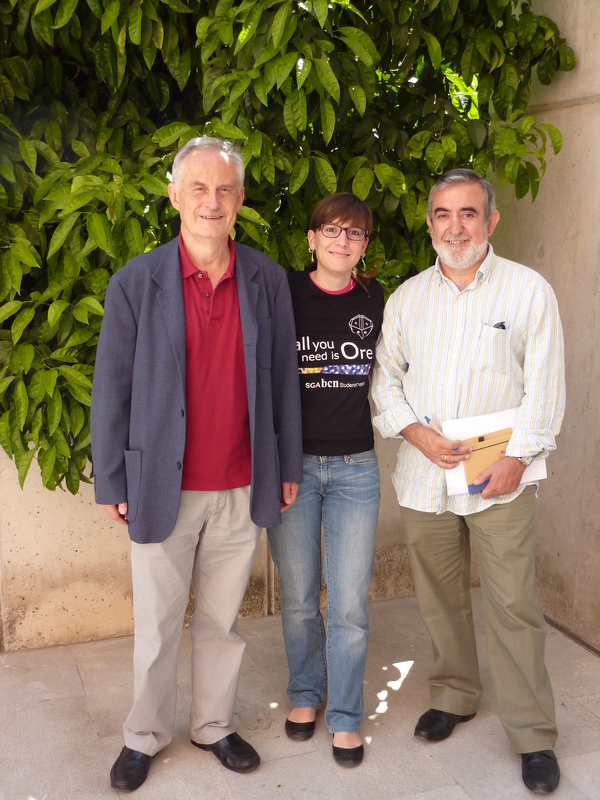 Our secretary accompanied by Dr. Fernando Nieto (left) and Dr. Fernando Gervilla (right), professors of the University of Granada and organizers of the EMU School 2013.